age limit: 5 years min. group size: 6 person min. It’s time to give football a whole new meaning! 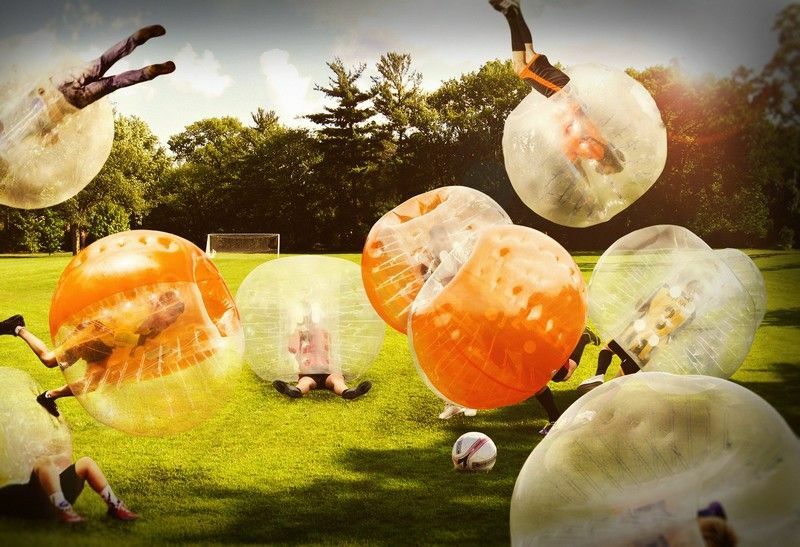 Bubble football is the latest craze in Budapest that everyone should try. Bet you’ve imagined to break through the defense line as an enormous bowling ball to score like you never did before: if you had similar thoughts, bubble football is definitely your game! Bubble football was invented by a group of crazy norwegians and became internationally popular shortly after its first release: in fact, soon there will be a Bubble football championship! The whole point of the game is that the players have to wear huge plastic orbs called Zorb balls, created especially to withstand bouncing and other insane acrobatic tricks. The rest of the game is just like regular football, the main goal is the same as well: score as much as you can and defend the opposite team’s attacks – but it’s up to you how you achieve it! There are fantastic tricks and dodges in football as well, but those are nothing compared to bubble football. Bounce, jump, roll or clash with each other, make your best stunt moves, do anything what your enemies can’t even dream of. Bubble football’s rules are basically the same as in football, but there are no red or yellow cards and you can do anything within the limits of common sense, just be careful not to hurt yourself or your mates. What about a trick when you pass forward the ball with three huge bounces, roll trough the defense line and score? It’s all possible in bubble football! At least 6 people can play bubble football on a proper field. The recommended maximum limit is 12 people to avoid a too crowded game. A match is at least 1 hour long, you can take a short break half-time if you want to rest for a few minutes. Don’t worry if you’re not a great football player as this game doesn’t require too much talent or experience, anyone can try it! According to the game’s unique features, football gaming experience won’t guarantee your success here, you can gain more if you can take all the opportunities in the game, and of course the benefits of the Zorb ball itself. If you and your team never played bubble football before, everyone will have the same chances. As for safety you don’t have to worry, since there are no possible major injuries in bubble football, and we always pay extra attention to the players physical health. The orb protects you from every bigger hits, you only have to care for your legs to be safe. Considering the possible injuries, you can’t bring any stinging objects on field, and according to this rule wearing soccer shoes are banned as well. Furthermore we do not recommend the game if you’re often experiencing dizziness, and playing while drunk is strictly forbidden. The recommended age limit is above 5 years. What do you get to play? You’ll definitely need a Zorb ball that we provide for each player in appropriate size. As you’ll be divided in two teams, each team is going to have different t-shirts to recognize your team members easily. To guarantee fair play, we give you a trained referee, who leads your game with best competence and pays attention to the few existing but neccesary rules Bubble football has. We’ll arrange the field rental for you, though that’s an extra fee beside the equipment rental, we provide a discount for you and your group. The more people come, the cheaper the game will be. Birthdays, family events of bachelor parties: we recommend Bubble football for everyone who wants to try a fun and exciting sport!